The first question that comes to mind is: Why did the author decide to take on this project? 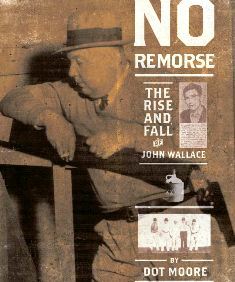 The 1948 murder trial and execution via electric chair of prominent businessman John Wallace in Coweta County, Georgia, for killing a man with whom he'd been involved in the moonshining business, had already been the topic of Margaret Ann Barnes's 1976 prize-winning, still in print best-seller, Murder in Coweta County, which Johnny Cash made into a 1983 TV movie. According to the press release and jacket blurbs, Dot Moore (author of the regional best-selling Oracle of the Ages, a colorful biography of Georgia fortune teller Mayhayley Lancaster, who makes an appearance in this cast), did her research in courthouse and Georgia State Board of Pardons and Paroles records, old magazines and newspapers, and Wallace family correspondence. I have not read the Barnes book, but there is a sense of verve and fresh insight in this riveting narrative that psychoanalyzes the complex main character and vividly recreates the era and the rural/small town locale. Most of the sixteen chapter titles begin with the word "Going": Going to Jail and the Altar, Going for Broke, Going for Lawyer Money. The next to the last title is called, finally and rather mournfully, Gone. Julia Oliver can be found on Facebook as Judy Oliver and "Julia Oliver, Author."